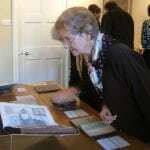 This Autumn saw the welcome return of the Adopt a Book Open Days, an occasion to thank those people who have generously supported the scheme to help conserve the Chapter Library, and an opportunity for them to see “their” book. The visit began with a chance to see where the books had been kept from the 17th century until 1999, with an introductory talk in the Vicars’ Hall. It then moved to their new accommodation in the Undercroft, where adopters’ books were on display for them to see, read and ask questions about. Included in the visit was time to see the exhibition of some of the highlights in the archive collections, and a display of other rare books from the Chapter Library. 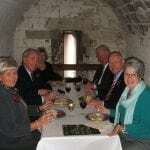 For those who wished to join us, lunch was served in the Dungeon. The 2 days were a huge success, and we would like to extend our thanks again to our wonderful adopters, without whom we would not be able to ensure the future survival of the splendid collection of rare books in our care. Next PostNext Richard Neville, a hard day’s knight?